The gradual breakdown of joint cartilage and the underlying bone leads to the onset of osteoarthritis (OA), a common form of arthritis that affects millions of people worldwide. OA represents a common cause of disability in the elderly population , causing severe deteriorations in patients’ quality of life and generating significant cost burdens. The development and testing of new regenerative strategies, such as autologous mesenchymal stem cell (MSC)-based treatments aimed at repairing cartilage or bone, requires a suitable model system and OA research commonly employ canine models . As the prevalence of the disease reaches 20% in adult dogs , patients of both the human and canine varieties could significantly benefit from the development of novel cost-effective therapies. 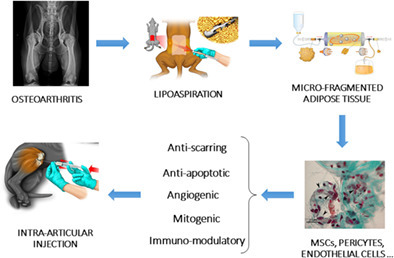 Now, a new STEM CELLS Translational Medicine from the laboratory of Offer Zeira (San Michele Veterinary Hospital, Tavazzano con Villavesco (LO), Italy) demonstrates the safety, feasibility, and benefits of single intra‐articular injections of MSC/pericyte-rich autologous micro‐fragmented adipose tissue (MFAT) [4, 5] in a canine model of OA in what could represent a time sparing and cost‐effective treatment strategy . The authors obtained MFAT using a minimally invasive technique in a closed system and then injected OA canine patients in either the intra‐ or the peri‐articular space in a single step procedure that eliminates the need for complex and time intensive cell culture processing. In total, the trial treated 346 joints of eight types in 130 canine patients with a mean age of six. The team hypothesized that the MSC-containing MFAT should provide potent analgesic, anti‐inflammatory, trophic, and reparative activities, and they discovered that MFAT injections led to improvements in the orthopedic and owners’ scores at one and six months in the majority of canine patients, with no local or systemic major adverse effects observed. Interestingly, medium and large dogs starting from a severe condition demonstrated greater improvements at six months compared to dogs starting from a less severe condition. The analysis of dogs that died within a year of MFAT injections (with deaths unrelated to MFAT-related procedures) demonstrated the presence of alterations to the articular cartilage together with wide areas covered by continuous cartilage. Cartilage generally presented with hybrid characteristics (a mix of hyaline and fibrous cartilage) and possessed overlapping regions positive for different collagen types. Overall, this suggests that while MFAT does not promote the formation of hyaline cartilage with normal mechanical properties or durability, it can generate cartilage that partially restores joint function and minimizes pain. This study highlights this one-step MFAT-based approach as a safe, feasible, and effective treatment strategy for OA, and given the time sparing and cost‐effective nature of this approach, they hope that their findings will represent a significant step towards an effective OA therapy for patients of both the human and canine varieties. For more on micro‐fragmented adipose tissue and all the new time sparing and cost‐effective treatment strategies for osteoarthritis, stay tuned to the Stem Cells Portal! How can the generation of hyaline cartilage from MFAT with normal mechanical properties or durability be promoted? What other diseases/disorders can be treated with MFAT? Are there any obstacles to the transfer of the MFAT system to human patients? Peat G, McCarney R, and Croft P, Knee pain and osteoarthritis in older adults: a review of community burden and current use of primary health care. Ann Rheum Dis 2001;60:91-7. Gregory MH, Capito N, Kuroki K, et al., A review of translational animal models for knee osteoarthritis. Arthritis 2012;2012. Johnston SA, Osteoarthritis. Joint anatomy, physiology, and pathobiology. Vet Clin North Am Small Anim Pract 1997;27:699-723. Ceserani V, Ferri A, Berenzi A, et al., Angiogenic and anti-inflammatory properties of micro-fragmented fat tissue and its derived mesenchymal stromal cells. Vasc Cell 2016;8:3. Bianchi F, Maioli M, Leonardi E, et al., A new nonenzymatic method and device to obtain a fat tissue derivative highly enriched in pericyte-like elements by mild mechanical forces from human lipoaspirates. Cell Transplant 2013;22:2063-77. Zeira O, Scaccia S, Pettinari L, et al., Intra-Articular Administration of Autologous Micro-Fragmented Adipose Tissue in Dogs with Spontaneous Osteoarthritis: Safety, Feasibility, and Clinical Outcomes. Stem Cells Translational Medicine 2018;7:819-828.